It doesn't take a backbone to be a genius - or a master of the comedic arts, apparently. 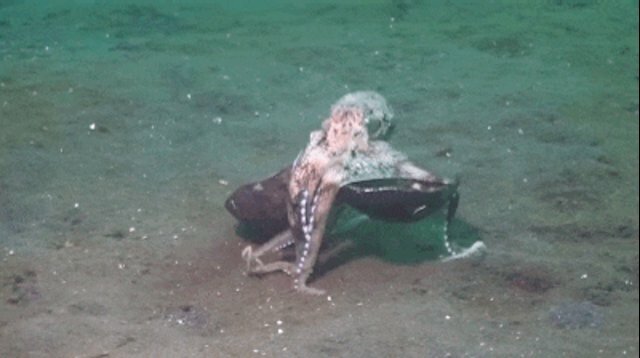 But this tentacled one knows exactly what he's doing. 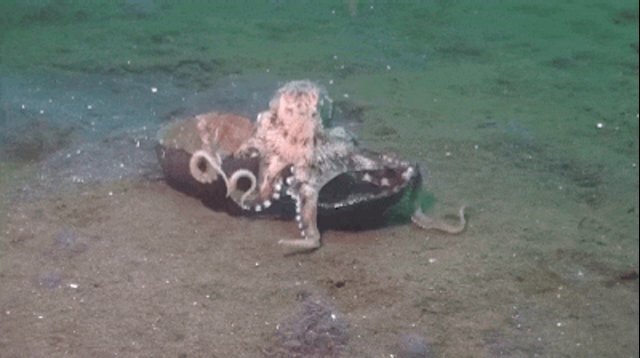 As it turns out, some octopuses, like this one, possess the foresight to actually pack along coconut shells to use as protective shelters when exploring areas without adequate places to hide. Interestingly, this incredible finding was nearly lost to science within moments after being discovered. Julian Finn, a researcher from the Victoria Museum in Australia, who was among the first scientists to have witnessed this behavior first hand, was so impressed by what he observed - it nearly killed him. "I almost drowned laughing when I saw this the first time," Finn told the BBC. "I could tell it was going to do something, but I didn't expect this - I didn't expect it would pick up the shell and run away with it."